Train for the Capital City Marathon with the Friends of Mia running group. Let’s get ready to run together, again. I’ve taken a break from running and writing, but the two things I love are coming back together for this article. Let’s start with a chat about local running groups. Running groups are where it’s at, and they are starting up in full-force again in January. If your 2015 to do list includes running the Capital City Marathon, Half-Marathon or 5 Miler, these training groups are starting up in January. This article will provide you with some quick information about each group, but your best option is to follow them on Facebook, check out their websites, and if you have specific questions, send them an email or message. 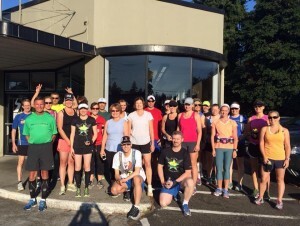 Club Oly Running has scheduled weekly runs plus specific training groups. Folks joining running groups usually fall into one of two categories – runners new to the sport or veteran runners looking to rekindle their commitment to running or looking to improve their times. Are you new to running or just starting out? Here is my quick list to alleviate your common questions. Do not stress that everyone else is going to be faster than you. Training groups cater to all speeds and abilities and you will most likely find another runner to fall into stride with. Do dress for the weather. It will be cold and wet if you train for a Spring event – you will want a good running coat or vest, gloves, hat, and running pants or tights. I see some runners wear headphones during longer training group runs. I personally don’t, but that might be a good question to ask the group organizer about. Do not break the rules of the road by jaywalking or ignoring stop lights. You’ll get the group in trouble, and no one likes that. Are you veteran runner looking for some consistency in your running or a race PR? Running with other runners will make that happen. I was told once and I have repeated this often – “want to run faster? Run with faster runners.” It’s not complicated. Not every run needs to be a sprint, but if you push yourself outside your comfort zone and jump into some faster workouts with faster runners, you will increase your speed. This does not mean if you are a 10 minute miler that you should go out and run mile repeats with a 5:30 minute miler. But, if you never push yourself on any training run (for example, you are never uncomfortable and can discuss in detail the podcast Serial) you need to add a quality run or two into your training week. Here’s the good news. 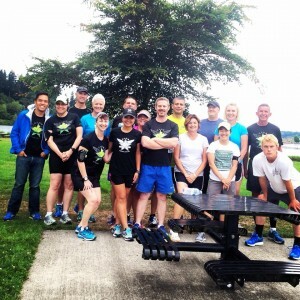 If you want to run five days a week with a group, you can easily do that in Thurston County. One way to stay inspired and up-to-date on local running groups is to have your Facebook daily news feed full of running groups posting workouts and upcoming events. Get ready to click “like” and be inspired. 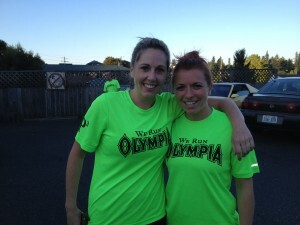 You can find many Olympia-based running groups, such as Club Oly Running, on Facebook. It’s a great way to keep up with all the scheduled events. The Barron Park Striders Track & Field Club is a private club dedicated to the development of athletic skills and the use of these skills in competition. The basic goal of the club is personal improvement; thus, no prior experience in the sport is necessary. Though the club is primarily a youth club, Masters and Open athletes are welcome. This is an informal running group that posts routes, days and times on their Facebook page. 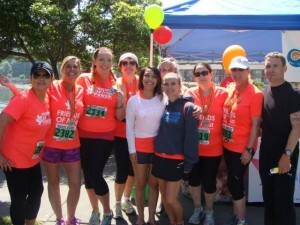 Train for the Capital City Marathon or Half- Marathon with this group. The cost includes an awesome training vest and runners that sign up for the training group get 15% off the marathon registration. Sign-up at South Sound Running. Club Oly Running provides weekly group runs and race specific training groups. They have weeknight social runs on Mondays and Wednesday, and quality runs on Tuesdays. Find their schedule here. Club Oly Running also offers race specific training groups and has an upcoming training program for the Capital City 5 Mile. Get details here. Join the Fit Life Team and train for the Capital City Marathon and Half-Marathon. Training program includes a training shirt and 100% of the proceeds from the training program goes to supporting LAM Disease and Huntington’s Disease. Fit Life coaches will guide you, coach you and provide you the motivation and inspiration to bet the runner you want to be. Find more information by clicking here. Join the Friends of Mia Power Team and train for the Capital City and Vancouver Sun Full and Half- Marathons. Training program includes a short and long sleeve training shirt, coaching, motivation and the opportunity to make a difference in the life of a child diagnosed with cancer. To sign up or learn more, click here. Guerilla Running offers weekly group runs and specific training programs for events. Run with the group on Monday (trails) or Wednesday (road) evenings and check with their website and Facebook page for up-to-date Guerilla happenings. Pints Pavement Pounders like to enjoy a beer after their Thursday night runs. Join them at Pints Barn in Tumwater. You need to ask to be invited to the Olympia Trail Runners Facebook group, but it’s not exclusive, they let me in. This group traditionally runs Thursday nights at Priest Point Park (seasonal) and often make Saturday treks out to Capital Forest. Join this group every Thursday night April through late November for their official training group runs, but they tend to unofficially run in the other months as well. Meet at 6:00 p.m. at the Pints Barn in Tumwater. All runs are three miles. Run Like a Grrl is a part of the Guerilla Running family. Make sure to follow them on Facebook. Spend an hour or so checking out the various groups in town and I’m sure you’ll find one that is the right fit for you.